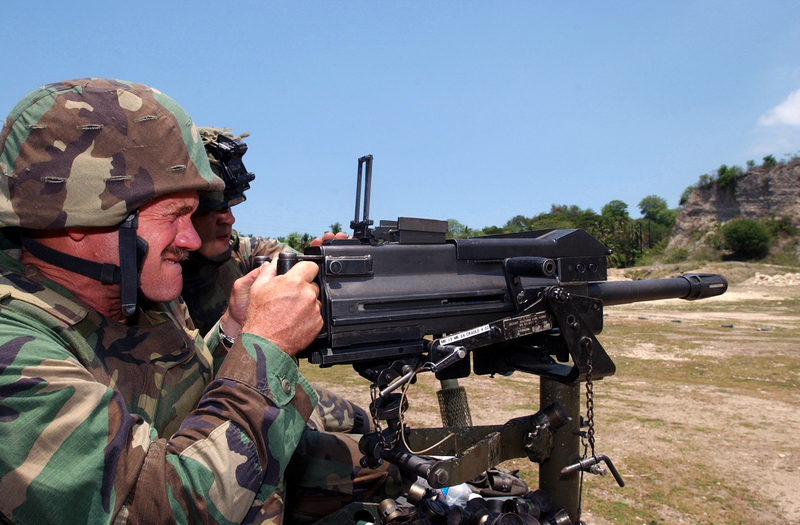 030414-N-6501M-036, Zamboanga City, Republic of the Philippines  U.S. Navy Boatswain Mate Master Chief (BMCM) Michael D. Bloom fires a Mark-19, 40mm grenade launcher with the assistance of U.S. Marine Corporal (Cpl) Ryan J. King during a crew/serve live fire exercise. BMCM Bloom is attached with Special Warfare Unit One, Guam and currently the Command Master Chief for the Joint Special Operation Task Force – Philippines (JSOTF-P). Cpl King is attached to the 3rd Battalion, 3rd Marine Kilo Company, also part of JSOTF-P, providing Force Protection for U.S. Military and Civilian personnel deployed to the South Philippines as part of Operation Enduring Freedom.